Filled with energetic idealism, Ransome Stoddard (Jimmy Stewart) is a civilized eastern man fresh from law school and ready to change the world. Riding on a stagecoach into the Old West with his law books in tow, he believes strongly in the strict principles of conventional justice. When his stagecoach is robbed, however, he quickly discovers the poor value of his ideals in this tough, uncaring environment. Vicious outlaw Liberty Valance (Lee Marvin) spots Stoddard's innocence and decides to educate him on the reality of the western world. He exclaims "I'll teach you law . . . Western law!" and proceeds to brutally beat him near death. With this act, Valence violates the principles of the civilized East and throws down the gauntlet for the battle between these contradictory concepts. John Ford's The Man Who Shot Liberty Valance aligns the viewer with the plight of Stoddard in the harsh town of Shinbone. This place mirrors the typical setting of the genre and sites such as the gritty saloon. However, signs of a new lifestyle exist even within this chaotic town. Dutton Peabody (Edmond O'Brien) writes stories in The Shinbone Star about the need for statehood and other pressing issues for this territory. Citizens will vote for delegates to a political convention that may decide the future of this area. Shinbone faces a crossroads between the encroaching elements of the refined East and the wide-open life of the West. The dominant culture of Stoddard's world aims to "improve" life through the principles of order and education. Although the changes appear positive, they may not have the desired effects on everyone in the population. Tom Doniphon (John Wayne) embodies the spirit of the Old West with his stern countenance and strict, realistic feelings concerning honor and the "true" laws of the land. Within this violent world where only the strongest survive, he realizes that sometimes force is the only path to achieve justice. 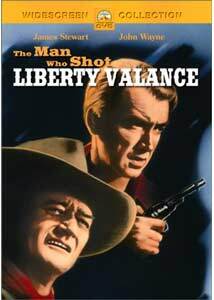 It is only Doniphon's gun that Liberty Valance fears in Shinbone. Although their ideals differ drastically, Doniphon and Stoddard form a bond of mutual respect aligned against the actions of Valence and his outlaw mentality. Both men also fall in love with Hallie (Vera Miles) - a fiery young woman willing to speak her mind against any person who treats her unfairly. While Stoddard recovers from his beating, he begins to introduce the ideas of civilization to the people of Shinbone. His major task is a class designed to teach the citizens how to read and write. The people of the town respond enthusiastically, but this also brings Stoddard in opposition with the ideals of the Old West. Both Doniphon and Valance disagree with his actions, and each conflict has a significant effect on his ultimate future. The tumultuous events climax with Valance challenging Stoddard to a gunfight, which will change the pattern of Shinbone and the entire area forever. John Wayne has given numerous memorable performances over his renowned career, but he sometimes comes off stiff and emotionless. In this film, however, his persona works perfectly to convey the mythological stature of the former western hero. His drunken scenes in the bar and skulking through the shadows are possibly his best performances. Jimmy Stewart also does an impressive job following his usual identity as the righteous and educated man. Vera Miles is given the difficult task of trying to match these acting giants, and she succeeds with flying colors. This film also contains memorable supporting characters, including O'Brien's Peabody and Andy Devine's lovable but cowardly Marshal Link Appleyard. John Carradine also shows up and produces a wonderful over-the-top cameo as orator Major Cassius Starbuckle. The Man Who Shot Liberty Valance stands as one of the greatest westerns of all time. John Ford takes an intimate look at the lives of several intriguing characters who embody differing themes during the twilight of the Old West. Ford's direction is unremarkable, but he incorporates several ingenious touches that add to the overall tone. During the gunfight, much of the events occur in shadow, with Stoddard finally coming into the light to face his destiny. There's also a remarkable tracking shot that follows a horse into the political convention; it works perfectly. While the plot may upon first viewing appear fairly simplistic, the writers continually add layers to each character and move the film well beyond a typical "good overcomes evil" story. The final poignant scenes strike an emotional chord that brings into question Ford's overall theme for this complex and fascinating story. Image Transfer Review: I'm continually amazed at the pristine digital restorations of older black and white films, and The Man Who Shot Liberty Valance represents one of the best examples. The western landscape of this 1.66:1 anamorphic widescreen transfer shines with light and sharpness. This picture stems from an excellent print and lacks the usual dirt specks inherent in even the better transfers from the time period. Although much of the action takes place indoors within confined areas, the visuals are stunning in their simplicity, especially during the shots shrouded in shadow. This picture is miles above previous VHS versions, and makes this disc worthwhile even to fans who already own the video. Audio Transfer Review: The 5.1-channel Dolby Digital transfer fails to fully utilize the rear speakers effectively, but it does provide a very good listening experience. One especially effective scene is the political convention, where cheers ring from all segments of the sound field for each candidate. While the age of the source material limits this audio track, it still succeeds in providing a clear and powerful viewing experience. This disc also contains a restored English mono transfer that contains a surprising amount of force and clarity. It falls a bit short of the other track, but it still sounds excellent, considering. Extras Review: The lone extra feature on this disc is the theatrical trailer, which comes in a decent widescreen transfer. It runs for a lengthy period and includes many of the pivotal scenes in the film with large, exclamatory text crossing the screen in a style typical of the time. No English subtitles are included. Although arguments can be made for The Searchers, The Wild Bunch, Unforgiven, and numerous others, I consider The Man Who Shot Liberty Valance my favorite western. This John Ford film may not have been his most influential, but it strikes a chord on both a personal level and in terms of larger themes. John Wayne gives one of his finest performances, and the story remains enthralling and entertaining until the very end.